Save the Weather Beacon! You can help! to all who helped Save the Beacon! Recently Phil & Mark, on behalf of KFYR AM Radio and those who contributed to save the Beacon, presented a check to the Commission to insure that the Beacon would be updated and repaired and will continue to shine over Bismarck! In this picture Burleigh County Commissioner Kermit Lidstrom accepts a check for $6,669 from the Save the Beacon Fund. To commemorate the event, the Phil & Mark Show broadcast live from the top of the Provident building. Once repairs are completed this fall, the show will once again come to you live to celebrate the new Beacon! Click here to view RealVideo of KFYR-TV reporter Cliff Naylor's story about the saving of the Beacon. 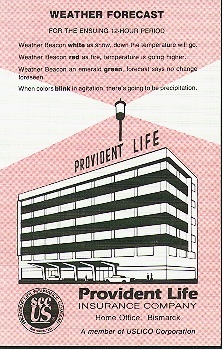 For 43 years, the Provident Life Weather Beacon has been a prominent landmark in Bismarck. 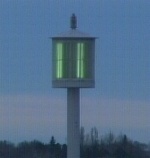 Operated 24 hours a day and updated by KFYR, the Beacon's colors indicate the forecast for the next 12 hours. KFYR-AM's Phil and Mark pledged their full support in helping to raise the money needed to save the Beacon. Thanks to the help of their listeners and others, the Beacon will shine over Bismarck for years to come. 10 years ago, the neon lights in the Beacon were replaced with fluorescent lights. Parts for these lights are no longer available, and they don't work as well as neon in the cold anyway. The Beacon will instead be rewired and refitted with a new lighting system. The Beacon is 60 feet high. Atop the 77 foot Provident Life Building, its height is 137 feet above ground. The entire Beacon weighs 10 tons and is a part of the building's structure. The two-foot steel tube contains rungs inside, allowing maintenance from within the Beacon. The face of the Beacon is plastic, with 90 fluorescent tubes inside. Three sets of 30 tubes give the Beacon its colors. 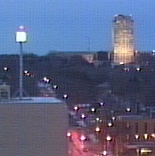 The colors of the beacon are kept up-to-date by the staff of KFYR TV, where the beacon's color controls are located. Do you know the Beacon's "code"? Weather Beacon white as snow, downthe temperature will go. Weather Beacon red as fire, temperature is goinghigher. Weather Beacon emerald green, forecast says no changeforseen. Copyright ©1997 KFYR Radio and Meyer Broadcasting Company.